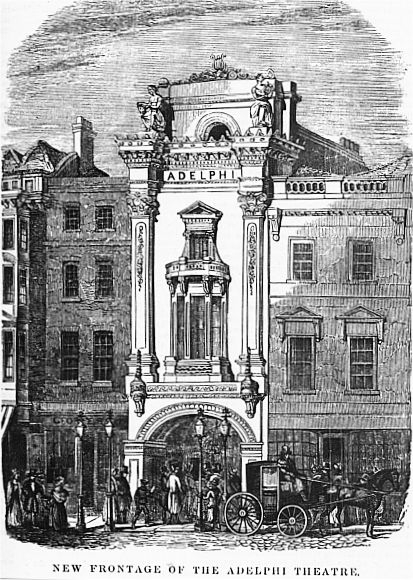 Adelphi Theatre Image, published c1840. Samuel Beazley, architect/playwright, designed the elaborate wide elliptically arched entrance opening to a deep porch. Above was a three-story high window flanked by boldly projecting Corinthian pilasters, surmounted by a segmental balcony. On the third story, a single round-arched window was flanked by the seated figures of Momus (Criticism) and Erato (Love Poetry), sculpted by Edward Davis. On top was a crested pediment topped with a lyre. In the Survey of London, 36, p.246, it was summed up as "a kind of profane elaboration of the Exeter Hall façade nearby," and "an essay in narrow-shouldered assertiveness."